April 19, 2016, 12:59 PM · In an effort to promote the coverage of live violin performance, Violinist.com each week presents links to reviews of notable concerts and recitals around the world. Anne Akiko Meyers performed the Bates with the National Symphony Orchestra. The Wall Street Journal: "Ms. Meyers played with consistent warmth and understated virtuosity, and Mr. Wolff and the orchestra made the most of Mr. Bates’s penchant for shifting constantly between vibrant, primary colors and gently dissonant pastels." Communities Digital News: "Ms. Meyers has taken this still-new concerto and made it her own, adding a kind of sublime excitement to an already interesting, almost New Age-y score, the kind of music that may finally succeed in warming audiences once again to a new kind of classical music that’s being created by still-living composers." 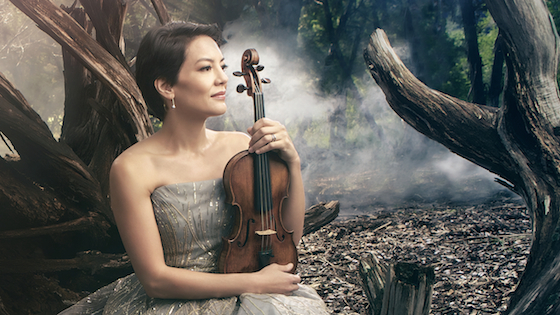 The Washington Post: "Soloist Anne Akiko Meyers, for whom the concerto was written, played with fire and songfulness." Anne Akiko Meyers. Photo by Molina Visuals. Julia Fischer, Ziyu He and Yesong Sophie Lee performed at the Menuhin Competition gala. The Telegraph: "In the Summer concerto from Vivaldi’s Four Seasons, (Junior First Prizewinner Yesong Sophie Lee) showed poise right from the slow introduction and led the orchestra with remarkable assurance. She displayed a fine sense of line and had all the colours needed for the tone-painting essential in this music....(Senior First Prizewinner) Ziyu He certainly had the glinting tone and dancing lightness for the finale of Dvorák’s Violin Concerto. But perhaps it wasn’t easy to establish much mood in this movement alone, and although he seemed willing to deliver fireworks, everything sounded a bit staid under the conductor Diego Matheuz....Searching and searingly intense in Bartók’s Violin Concerto No. 1, (juror and former winner) Julia Fischer and the orchestra caught all the work’s rapture...Fischer’s sterling performance was a just reminder that this competition has often got it right. Leila Josefowicz performed Adams' "Scheherazade.2" with the Los Angeles Philharmonic. Los Angeles Times: "Her virtuosity is extraordinary, but even more extraordinary is her expressive power. She is the Wonder Woman of violinists, physically able to respond to whatever is thrown at her but also temperamentally and theatrically transformative. She carries the concerto." Gil Shaham performed Bach Sonatas and Partitas in Seattle. The Seattle Times: "Each phrase was shaped by his infinitely pliant bow, sometimes slowly questing and searching, sometimes joyfully taking off like a startled rhebok." Augustin Hadelich performed tango music with pianist Joyce Yang and guitarist Pablo Villegas in Orange County. Orange County Register: "(Hadelich) stood center stage for Ysaÿe’s Sonata No. 6...and played it like a conquering hero. Elsewhere, he proved stylish in a good way, using portamento judiciously but otherwise not overplaying his hand by overjuicing the popular music idioms. Joseph Swensen performed and conducted the Brahms with Northwest Sinfonietta. The News Tribune: " And Swensen himself played virtuosically, with unbelievably fast tremoli in the cadenza and a wild, sweeping energy in the finale. Yet the piece missed many moments that should have had more nuance — sudden pianissimos, charging tuttis — and Swensen’s long notes repeatedly flatlined, going nowhere as his brain very obviously was giving half of its power to simply keeping everyone together." Joshua Bell traveled to Cuba this week as part of a team of U.S. artists and politicians on a cultural mission. The visit includes scholarly and artistic events as well as meetings with Cuban government officials and directors of cultural institutions. Other artists on the trip include Adele Chatfield-Taylor, Martha Clarke, John Guare, DJ IZ, Lourdes Lopez, Larisa Martinez, Dave Matthews, Kal Penn, Smokey Robinson, Usher, Alfre Woodard, and John Lloyd Young. Politicians include President’s Committee on the Arts and the Humanities (PCAH) co-chairs George Stevens, Jr. and Margo Lion; National Endowment for the Arts Chairman Jane Chu; National Endowment for the Humanities Chairman William Adams; and Smithsonian Secretary David Skorton. Anne Akiko Meyers also broke her foot last week (don't text and walk!) Wishing her a speedy recovery.